Doing laundry is one of those tasks that is tedious to do and devastating if you don’t do. 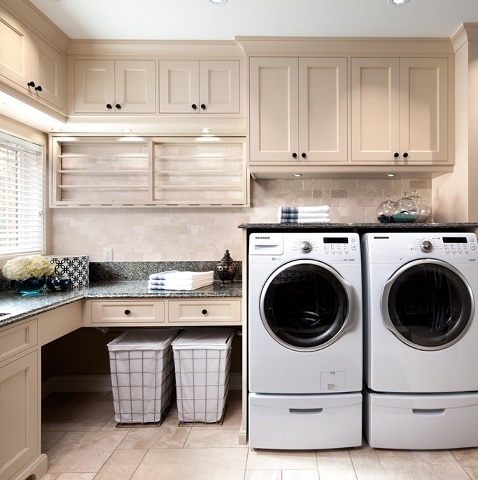 Between gathering all the clothes in the house, sorting the whites and colors, swapping wet clothes between the washer and dryer, and getting everything back out to be worn again, you likely spend way more time than you would like in the laundry room. For those of you hoping to shave a few minutes off your cleaning schedule, here are five different ways you can shorten your time spent doing the laundry and make life just a little easier. One dramatic way to lessen the amount of work you do in the laundry room is by getting rid of the step where you move your wet clothes into the dryer entirely. A washer/dryer combination appliance eliminates the need to change machines because it works as both in one! Rather than heating your clothes, washer/dryer combos wick away water, which collects in a condensing chamber and then flows out a drain pipe. While gentler on your clothes than rapid heating, it does double the drying from about an hour and a half to three hours per drying cycle. That said, the washing time is the same, and the machine can be set to run both cycles back-to-back without you having to do anything in between. Easy to access storage is another way to cut out the work for you when washing. A sink with a vanity attached keeps soaps, fabric softeners, and detergents closer at hand than a typical separate linen closet. If you need to keep these items out of children’s hands, a vanity for your laundry room can also accommodate child locks to keep curious hands out. This way, washing your clothes doesn’t also become difficult for you to do by putting everything on high shelves or out of your way. 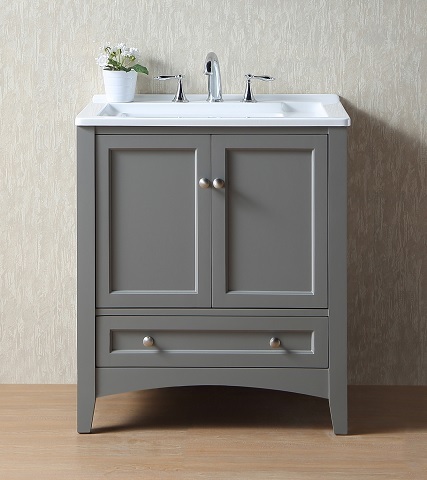 If you simply need the sink for utility purposes and don’t want or need the space for storage, cut out the vanity and have a large freestanding or wall mounted utility sink instead. 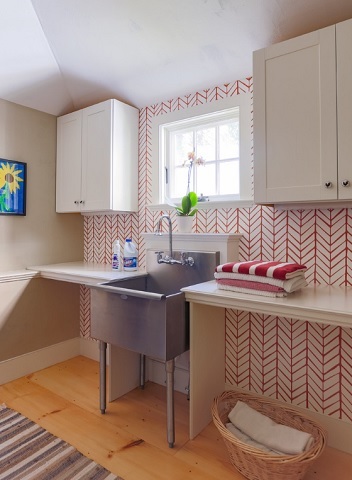 This kind of sink is better for hand washing and soaking in your laundry room than a sink with a vanity, as there is no hardware to get in the way of how deep the basin is. The big drawback is that utility sinks aren’t designed with any frills or decoration in mind, making it a very plain aesthetic addition in comparison to a vanity sink. Just as important as how much room you have in your laundry room sink is how you can wash your hands and clothes with the faucet. A swivel sink faucet makes washing easier by being high above the basin so that you can fill containers in the sink without tipping them at an angle, and able to move around to spray and reach more of the basin than a basic faucet. Another way you can do this is to have a pull-out sprayer in your faucet, which allows you to move the head to many angles you can’t reach with a downward facing faucet. Just like how clear labels help you sort through your filing cabinets and computer folders faster, it can help in the laundry room as well. Try having separate hampers for whites, colors, towels, and delicates. If you can find hampers in multiple colors or with a pocket for labels, this will encourage everyone in your house to toss their laundry into the right containers. This way, there is no need for you to sort through clothes while loading them into the washer, cutting back on time spent doing prep work. 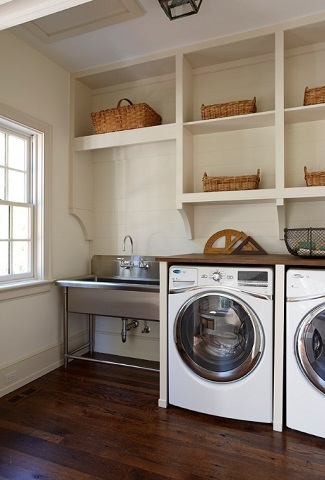 Not all of these ideas will help in every laundry room due to your preferences, budget, and space available. But every minute you shave off doing ten loads of laundry is time spent doing literally anything else more thrilling. 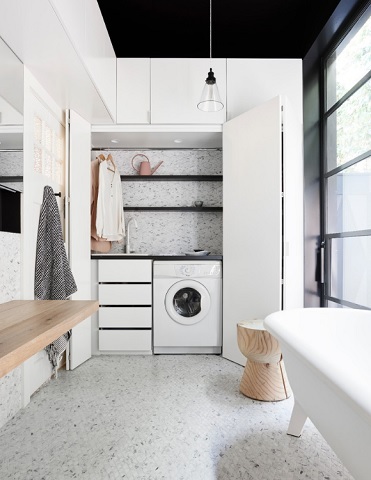 This entry was posted in Decorating Ideas and Tips, Latest Trends and tagged laundry care, Laundry Room, Laundry Sink, laundry storage.